Canyon de Chelly National Monument (/dəˈʃeɪ/ də-SHAY) was established on April 1, 1931 as a unit of the National Park Service. It is located in northeastern Arizona within the boundaries of the Navajo Nation. Reflecting one of the longest continuously inhabited landscapes of North America, it preserves ruins of the early indigenous tribes that lived in the area, including the Ancient Pueblo Peoples (also called Anasazi) and Navajo. The monument covers 83,840 acres (131.0 sq mi; 339.3 km2) and encompasses the floors and rims of the three major canyons: de Chelly, del Muerto, and Monument. These canyons were cut by streams with headwaters in the Chuska mountains just to the east of the monument. None of the land is federally owned. In 2009 Canyon de Chelly National Monument was recognized as one of the most-visited national monuments in the United States. The name chelly (or Chelley) is a Spanish borrowing of the Navajo word Tséyiʼ, which means "canyon" (literally "inside the rock" < tsé "rock" + -yiʼ "inside of, within"). The Navajo pronunciation is IPA: [tséɣiʔ]. The Spanish pronunciation of de Chelly [deˈtʃeʎi] was adapted into English, apparently through modelling after a French-like spelling pronunciation, and now /dəˈʃeɪ/ də-SHAY. 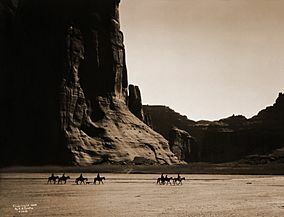 Canyon de Chelly is entirely owned by the Navajo Tribal Trust of the Navajo Nation. It is the only National Park Service unit that is owned and cooperatively managed in this manner. Approximately 40 Navajo families live in the park. Access to the canyon floor is restricted, and visitors are allowed to travel in the canyons only when accompanied by a park ranger or an authorized Navajo guide. The only exception to this rule is the White House Ruin Trail. 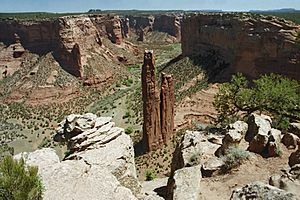 The park's distinctive geologic feature, Spider Rock, is a sandstone spire that rises 750 feet (229 m) from the canyon floor at the junction of Canyon de Chelly and Monument Canyon. Spider Rock can be seen from South Rim Drive. It has served as the scene of a number of television commercials. According to traditional Navajo beliefs the taller of the two spires is the home of Spider Grandmother. Most park visitors arrive by automobile and view Canyon de Chelly from the rim, following both North Rim Drive and South Rim Drive. Ancient ruins and geologic structures are visible, but in the distance, from turnoffs on each of these routes. Deep within the park is Mummy Cave. It features structures that have been built at various times in history. Private Navajo-owned companies offer tours of the canyon floor by horseback, hiking or 4-wheel drive vehicle. The companies can be contacted directly for prices and arrangements. There is no entrance fee to enter the park, apart from any charges imposed by tour companies. Canyon de Chelly National Monument Facts for Kids. Kiddle Encyclopedia.